It’s just really important that people understand that we’re going to be responsible about environmental cleanup. That we’re going to take an industrial area and repurpose it just like San Francisco with AT&T Park or Oracle Park. I’m sure this has been communicated to the various community groups the A’s are corresponding with. I hadn’t heard it quite so publicly stated until now. I just wonder how effective this strategy will be. I get annoyed that when someone points out some problem with Howard Terminal, people jump to the conclusion that HT won’t happen. But then everywhere else the A’s tried, they gave up as soon as there were problems, so I’m not sure why I’m annoyed at this historical accuracy. The script should be rather familiar by now. The A’s release news of a new site they’re interested in. Then someone mentions a process-related NIMBY issue in an article. The team says everything’s fine and everyone’s being heard, all while opposition mounts. Eventually the team moves on to the next dream site, sometimes scaling back the vision, sometimes expanding it. This happened at the Coliseum North site, then at Fremont, followed by San Jose, and finally the Peralta/Laney site. It’s practically like clockwork. What concerns me is that the word you rarely hear in these public talks is the one word needed to forge a deal: compromise. It’s almost as if the strategy is that local government or a court will step in and rule for the A’s. There’s rarely any talk about how it could affect entrenched parties. I’ve heard a lot comments to the tune of, It’s hard but was it as hard as X? At this point, whether it’s harder than “X” is largely academic. If it’s hard enough to kill the project, that’s enough, and try as we might deign to understand the process, we can still have a very difficult time with those implications if we maintain blind spots. 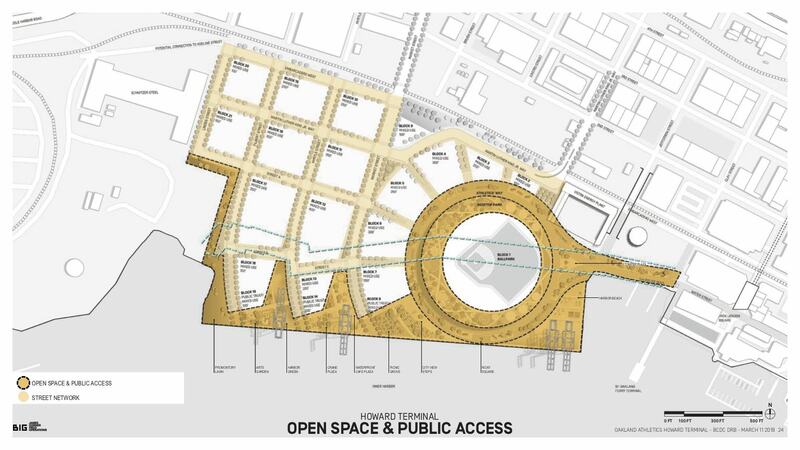 The one real effort to compromise with the Port pledged by the A’s so far is their willingness to remove several acres of land at Howard Terminal in order to expand the turning basin in the Inner Harbor. 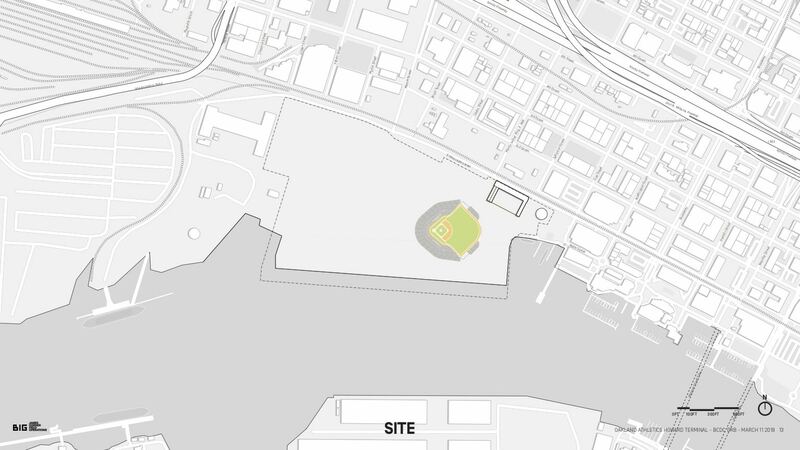 The one real effort to compromise with the Port pledged by the A’s so far is their willingness to remove several acres of land at Howard Terminal in order to expand the turning basin in the Inner Harbor. I’m surprised at how little press this has received so far, since it could significantly transform the shoreline along the Estuary and maritime uses. Schnitzer Steel could be affected as well, though how much isn’t clear. 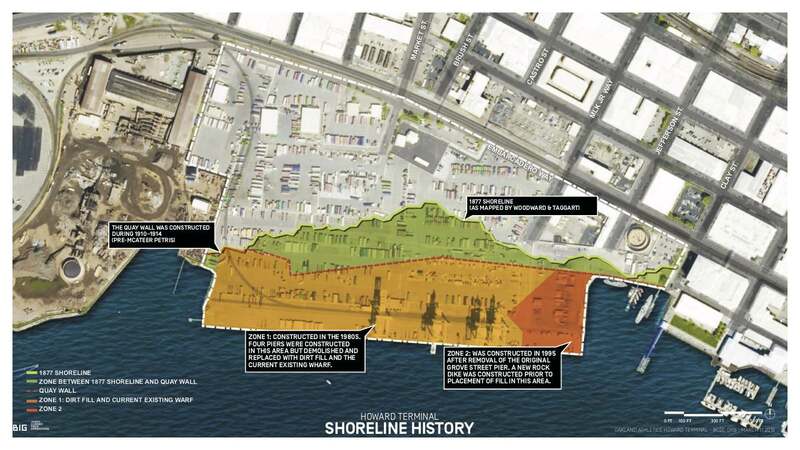 Port interests have been upfront that redevelopment of Howard Terminal threatens their operations and livelihood. Perhaps that’s an overreaction, especially if the Port itself isn’t running at capacity. However, there is an argument that giving up shoreline from a purely commercial (real estate) interest is short-sighted. AT&T Park was made possible by the closure and decommissioning of the Embarcadero Freeway in San Francisco after Loma Prieta, which allowed the city to remake the entire waterfront from Mission Bay to Broadway. 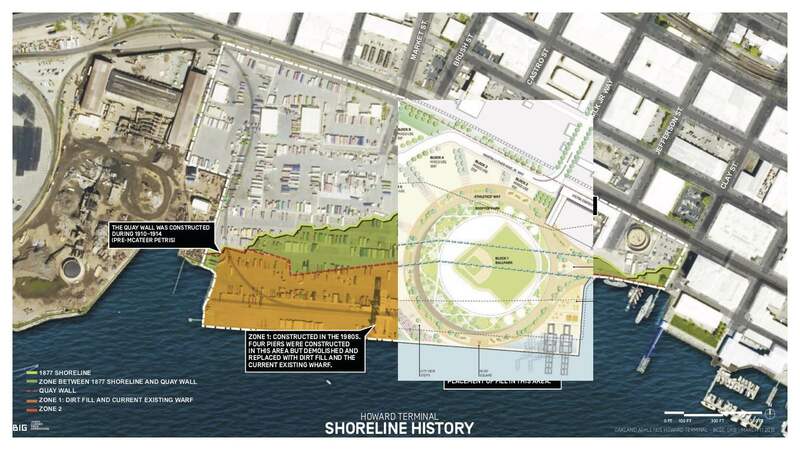 The A’s aren’t asking to reform the Oakland waterfront the way the SF waterfront was redone after the earthquake. But if port interests feel threatened by even the hint of a transformation, you have to understand the history of the Port. The Oakland waterfront became a thriving industrial area thanks in part to San Francisco giving up industry on its inner bayside shoreline. Accessible shoreline for large ships and boats doesn’t grow on trees. Short-term concerns, such as impacts on heavy truck and rail traffic, have gotten vague suggestions for accommodation so far. Meanwhile, the Port continues to expand its operations thanks to its takeover and cleanup of the old Oakland Army Base. In the map above, you’ll see that the Oakland shoreline is mostly divided into three zones. The maritime area, where traditional port operations take place, is in West Oakland. The commercial sector covers the Acorn neighborhood south of the 880-980 split through Jack London Square and out to Brooklyn Basin and Jingletown and East Oakland. The airport is its own economic engine. What we’re really talking about, then, is a sort of zoning turf war, with the commercial sector encroaching upon the maritime operations even as the maritime area itself expanded over the last twenty years. Butner said a decision will be made hopefully by the end of April. “Unlike politicians, we will not be kicking the can down the road,” he said. Butner, who a couple years ago saved Speakeasy Brewing after the company shut down, could help determine the fate of another treasured Bay Area institution. I’m assembling a bunch of thoughts about the new renderings unveiled at the BCDC session earlier this week. For now I picked out one snippet which I’ll share here. You can see the rooftop park above the ballpark to the right. A potentially 300-foot tall building is to the left. What’s that on the top? More seats! Would those count as part of the park’s daily attendance figures, or are they they suites for the ultra-wealthy? Take a guess. What’s really interesting is that the 300′ building isn’t alone. Behind home plate, there will be another building, 400 feet tall. I figured it would be worth showing what that might look like. If it matters, the current tallest building in Oakland is the Ordway Building, home of Kaiser Permanente, and near Kaiser Center and the Cathedral of Christ the Light. More thoughts over the weekend. 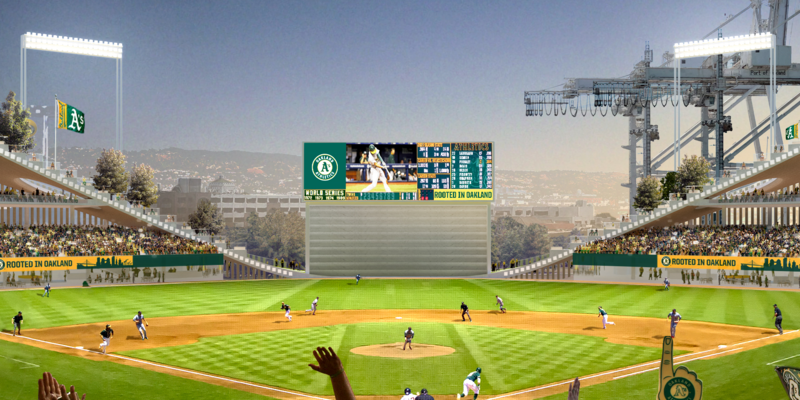 The A’s will be one of the subjects of a slew of public meetings in the coming weeks. Apologies for being late to post this (for those who might attend tonight’s BCDC session). There will be another. Follow this link for more information. Port of Oakland meetings are held in Jack London Square. BCDC meetings are held at 530 Water Street in San Francisco. If you can’t make it to any meetings, at least read Bill Shaikin’ LA Times piece on the A’s plans. 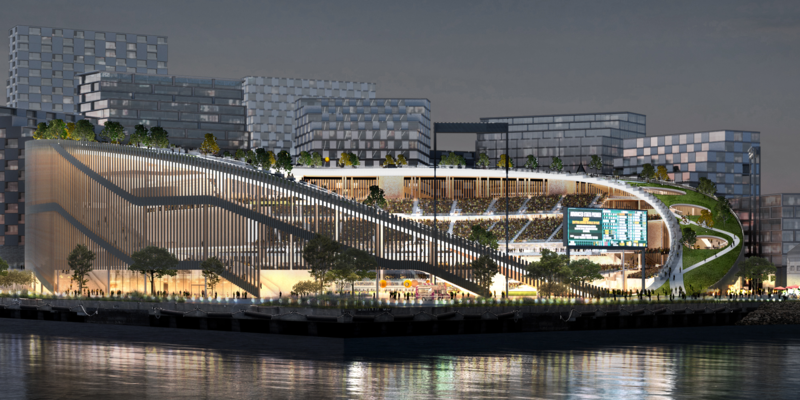 The A’s put out some updated renderings of their vision at Howard Terminal. 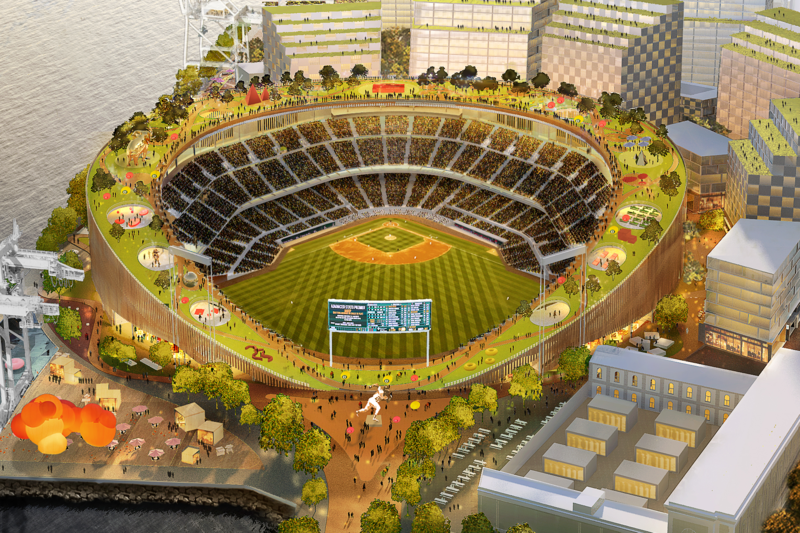 You can see some of the images at the A’s Oakland Ballpark site. I’m going to do a bit of a deep dive, so stick around for that. First up, a glimpse of that retractable batter’s eye (click on each picture for a larger version). I imagine the final color will be forest green or black, and covered with flat paint or non-reflective vinyl. There’s also a chance it could be used as signage, so it may be best to stick with a more neutral color. In the end, it is the batter’s eye, so the vision of batters will come first. The other thing I immediately noticed from this image: light standards! These will supplement the main lights which will be tucked under the rim of the roof deck. The LED lights will be angled down towards the field, and I suppose the outfield light standards will as well, though it is those light standards that will arouse complaints from the Bar Pilots. The most similar lighting design from a true outdoor stadium (no retractable roof) I can think of is at Red Bull Arena in Harrison, NJ. A few notes on the above picture: You can see the lights beneath the roof deck rim. They are arranged in squares, which might look something like this. The intriguing aspect of the above pic is the presence of red pyramids. I have to assume that they’re tents, but what if they were something else? Monuments? Obelisks? Whatever the case, I can tell you what’s gone: hobbit holes. Perhaps the A’s brass got sick of all the LOTR references (*raises hand*) and while I can’t blame them if they did, surely they know by now that we talked about hobbit holes mostly out of love and only partly in jest, the same way we would talk about second breakfast. The hobbit holes have been replaced by larger openings. And I can’t forget the big statue of Rickey beyond the scoreboard. Perhaps the big takeaway is that the ballpark itself has transformed from a “jewel box” squarish shape to a circular one reminiscent of the Coliseum. The seating bowl maintains its minimal foul territory and angles at the foul poles. The roof deck looks like a big green “O”, which should look great via an overhead blimp or helicopter shot. The roof deck should also easier to navigate if it becomes a public space such as a park. In the image below, you can also see the descent from the corners to centerfield, which has a series of little platforms facing the field at different elevations. There’s also a big statue of an elephant on the first base side. My initial take on the architecture was some surprise at the seeming lack of exterior treatment. The new version has a façade made of concrete, steel, or wood that gives the whole exterior a vertical blind effect. Glass curtainwall is played out, so this is a refreshing change. You can also see the circulation inside through the facade. I personally loved how that was visible in the old Oakland Coliseum Arena. Here fans could go directly to the roof deck via the sloped sections or take escalators or stairs on the main concourses. As for the bullpens – there’s space for them, though not necessarily the space you prefer. I consider it in flux.